What does Sponsoring a Child mean? Whilst we call it ‘sponsoring’ a child, as this is the term the larger charities use, what you are actually doing is providing the After School Clubs with a reliable regular income to cover their main running costs e.g. the salaries of the facilitators, managers and cooks of the three clubs, a vital nutritional meal every week day, life skills and counselling. The main aim of these clubs is to give the children hope, provide a safe haven and to enable them to escape from poverty through education. Sponsors receive regular information about the clubs. Those who choose to support a named child also receive an update on the child’s progress. We hope that these progress reports will enable sponsors to see what a difference their money makes. To sponsor a child at an After School Club, you usually make regular monthly donations of £10 per child. You could, of course, sponsor more than one child, which would be wonderful. In this case, your monthly payments would be £20 for 2 children, £30 for 3, and so on. 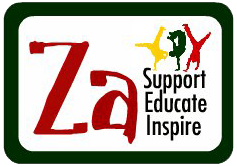 Why should I sponsor a child through Za Foundation / Thembalethu? Sponsoring is a personal way to support deprived children and there are many organisations that do this. They all work in different ways and sometimes it is difficult to know exactly how your donations have been spent. Many are large organisations and their overheads are high, so a percentage of your donation goes towards administration costs, often as much as 20%. By sponsoring a child through Za Foundation, you can be sure that 100% of your money, including Gift Aid, will go directly to the running of the clubs to provide that child with all the vital life skills needed for hope of a future. There will be no administration costs as the sponsorship programme is run by volunteers. Za Foundation works extremely closely with their partner charity, Thembalethu, who facilitates these After School Clubs. The CEO of Thembalethu , Cleopas Maseko, is also a Director of Za Foundation and he has the welfare of the children uppermost. As a sponsor, you will see the difference you are helping to make. Through the child you sponsor, and through Thembalethu After School Clubs you will gain an insight into lives of children living in rural South Africa. Do I have to sponsor a particular child? No; the choice is yours. Some sponsors prefer to support the clubs as a whole, by sending enough funds to support one, or more, of the children, but if you would like to take a particular interest in an individual child, we are happy to arrange this for you. Sponsoring the clubs: you can choose to send a regular monthly donation to help cover the costs of running the After School Clubs, which include paying the staff salaries, all the activities mentioned and providing the children with a nutritious meal. All you need to do is complete the attached Sponsorship Form and return to the address shown. How is the sponsor money used? The money you give doesn’t go directly to your sponsored child or family, it goes to the After School Clubs to cover their running costs and to ensure that it meets the needs of every child. The Sponsorship Scheme is run by Za Foundation who cover the administration costs, so that 100% of the donations, together with Gift Aid, go directly into the clubs’ funds. Can I choose the child I sponsor? We need to protect the children in our clubs and therefore cannot put their details or photographs on the internet for sponsors to view. You can however choose to communicate through Za Foundation with either a girl or boy and if you would like a child of a particular age, or if you have any other preferences, please let us know and we will try to match your requirements. You will then be sent details of the child with photographs. You will receive regular information about the After School Clubs and the child. We hope these updates will enable you to see what a difference your money makes. What about letter writing, Christmas and Birthday presents? Sometimes, sponsors ask whether it is possible to send birthday or Christmas presents to their child. Unfortunately, items posted to South Africa rarely arrive at their destination and if they do may incur customs taxes or duty. We are very keen to ensure that all the children are treated the same, whether or not they have sponsors, and we do not want to create “haves” and “have-nots” i.e. “sponsored” and “not sponsored ” among the children. Our aim is to provide a meal every day, especially over the Christmas holidays when Thembalethu is in theory closed. Contributions towards this, and extra meals to be taken home to the family, instead of an individual present, are very welcome throughout the year. Yes. This is a good way of being involved with the After School Clubs if you are unable to commit yourself to the full monthly payments. We welcome friends, schools, work colleagues or other groups and we believe that this is a great opportunity to gain an insight into the lives of children in rural South Africa. If you do decide to sponsor as part of a group, we need to have one nominated person as the point of contact to whom we can send all the information and updates. How often will I hear from the child or After School Club? When you first sponsor a child, you will receive a welcome pack with further information.and you will then be sent regular reports on the progress of the clubs. If you have chosen to communicate with a named child or children, they will write a letter or draw a picture, depending on their abilities, and this will be sent to you with updated photos. There will be regular updates on the Za Foundation website so you can see at any time what is happening in South Africa. How long do I continue to be a sponsor? To help us see your child’s education through to conclusion, we hope you can support us for a number of years. However, we appreciate that your circumstances may change, and you can withdraw your support at any time. In that situation we would endeavour to find another sponsor for the child. Once your child completes their education and leaves the club, we would hope that you would continue with your interest in Thembalethu After School Clubs, in other ways if not by further sponsorship. My child has left the After School Club – what happens now? South Africa is a very fluid country and unexpected things happen every day. Whilst most of our children attend the clubs daily some just disappear without warning. Our intention is to pair you with a child who consistently attends the club. Obviously we cannot guarantee that this will always be the case, but you can rest assured that our Social Worker will do her best to track the child down and find out their situation. If they no longer attend the club then we would be grateful if you would consider sponsoring another child who will be equally in need. They may also leave due to age as the clubs only cater for children up to 17 years old. At that point we would also ask if you would consider sponsoring another child and building a relationship with them. I would like to sponsor a child – what next? We would be happy to answer any queries you may have. Alternatively, please complete the attached Sponsorship Form and return it to the address shown. © 2019 Za Foundation | WordPress Theme: Elementare by CrestaProject.